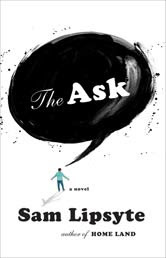 A howl from the bowels of nonprofit development, The Ask by Sam Lipsyte is a perverse heist-movie of a book. Coen brothers funny, it offers poignant humiliations and not-quite redemption. A scene on page 270 between narrator Milo and his preschooler, Bernie, struck me dumb. I’ll spend the summer mulling over this Lipsyte insight. I yanked him to me, buried my face against his strong, tiny neck. See Something (Nice)? Say Something.